We are getting closer to the 2019 Detroit Auto Show where the debut of the heavy-duty Ram trucks should take place. Chevy already revealed the uniquely styled Silverado 2500 which comes with the new gasoline engine and familiar turbodiesel unit. Ram has been spotted on several occasions while testing the redesigned HD models but every time heavily disguised. 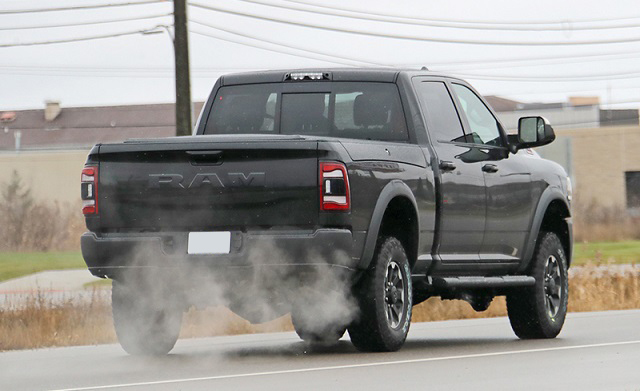 However, the spy photographers caught the fully undisguised 2020 Ram Power Wagon parading on the road. The new Ram 2500-based Power Wagon bears the similar styling as the recently redesigned, light-duty, half-ton Ram Rebel. The model has also the beefed-up off-road gear and tires while Ram still hides details about the powertrains and equipment. The reports suggest the return of the familiar engine options in the new Ram HD trucks and the interior should also borrow heavily from the smaller cousin. The 2020 Ram Power Wagon revealed its new Ram-1500 inspired look ahead of the approaching debut. 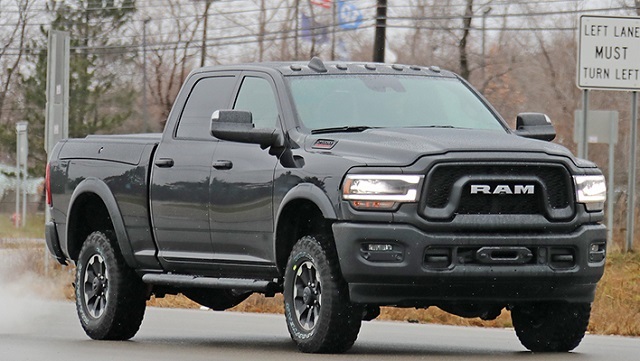 As we expected when the camouflaged prototypes appeared on roads, the all-new Power Wagon and other Ram HD models will adopt the similar styling as the fast-selling Ram 1500. The Power Wagon will use the half-ton Ram Rebel as the inspiration but the larger and off-road ready Ram 2500 has an even more muscular appearance. The front section of the truck is defined with the Rebel-like grille and the new, blacked-out headlights with the LED running lights on the top and bottom of the new units. The new Power Wagon has also the new front bumper with the factory integrated winch and the sculpted hood. The cab mounted lights can also be detected and the rugged truck uses longer wheel travel and knobby, all-terrain tires. The wider fender flares and new taillights will also define the new Power Wagon. The truck will likely appear in the crew-cab form and with the short bed again. Inside the cabin, we should expect the same layout and design as in the redesigned Ram 1500. The Power Wagon will get unique textures and materials. The truck will also use the latest Uconnect 4 infotainment system probably with the 8.4-inch center screen by default. The industry largest 12.0-inch touchscreen could also be available as the option. Ram will likely offer the Power Wagon as the trim option or an option package like in the current generation Ram 2500. The crew-cab Ram HD should also improve the interior comfort thanks to the revised dimensions. The current Power Wagon comes exclusively with the 6.4-liter Hemi V-6 engine and the six-speed automatic transmission. The engine makes 450 hp and torque of 429 lb-ft. The new generation 2020 Ram Power Wagon will likely repeat the Hemi V-6 engine but Ram could boost its performance. The new 8-speed automatic transmission is also the possibility. Some sources claim that the Cummins I-6 engine could also be available with the new generation version. The Power Wagon will also equip the upgraded off-road rig and ride on the massive, all-terrain tires. The model will also boost its capability with the lifted suspension and Bilstein shocks, front and rear locking differentials, electronically disconnecting sway bars, skid plates, etc. The 2020 Ram Power Wagon should reveal all secrets at the next Detroit Auto Show. The price will be known later but the model should start around $55, 000.